It’s gameday again! I’ll admit, I’m a bit down in the dumps as I write this post. My beloved Auburn Tigers just lost to Mississippi State. Honestly, I haven’t seen Auburn play that poorly in a long time, and State deserved to win it. I just hope that we can manage a decent season after this rough loss. However, in spite of the dismal, stressful, upsetting football game, we have enjoyed a morning of good food and family. Because hey, even if you have to suffer a loss, you can still enjoy some tailgate food! These Rotel cups are perfect for snacking on during a football party! We’ve made the classic Rotel dip (melted velveeta cheese with sausage and rotel tomatoes) many many times before. We love that cheese dip, but honestly it’s not easy to serve or eat individually because it’s kind of messy. These Rotel cups are REALLY good, and much better for party finger-foods. I love the crispy shells with the cheesy, bacony filling. It has a little kick to it from the Rotel, but it’s not overly spicy. And these are really easy to put together. I will definitely be making this again at future football parties! YUM! I can’t wait to try this. But I’m not a big fan of Swiss cheese, so I may go with cheddar or low-fat mozzarella instead. Thanks for the idea! Ya know, I actually hate Swiss cheese by itself, and I thought about using a different cheese too But I stuck with the Swiss and couldn’t really taste it in the mix It just gives a good melted gooey consistency If you do try it with a different cheese, let me know how it is! Swiss cheese has a lot less sodium so I plan to try it. Sounds great! This looks delicious!! I’m a big Auburn fan too and was heart broken Saturday too Will try to fix these for the next game! War Eagle Lindsay!! War Eagle Rhonda! So good to find another Auburn fan on here! Saturday was rough, but I still have faith in our guys! In case you haven’t seen them, you should check out the Tiger Brownies I posted a few days ago They were a big hit at our football party and looked really cool! Will definitely try! WAR EAGLE! WAR EAGLE! Maybe you can make them tomorrow for the National Championship game! I don’t know about you, but I’m cheering against Bama :-). I’m glad you were disappointed! Too bad you aren’t an SEC fan… Notre Dame went home with their tails between their legs! RTR! I truly am an SEC fan I cheer for every team in the SEC except for Alabama And I really dislike Notre Dame as well, but they were the lesser of two evils I don’t think anyone really believed that ND stood a chance, though. Crazy as it is my alabama husband will root for auburn if they are playing a team outside the sec! Sometimes those bama boys be crazy! Treats look good for a bama victory party! Roll tide! Not sure about your cooking instructions here My grocery store doesn’t have bags of bacon pieces, so I’m guessing that small pieces cut from slices of bacon would work, but it doesn’t seem right that you throw them in there raw with the mayo-cheese mixture Doesn’t that make the cup awfully greasy? Or are the bacon pieces you’re using already cooked? Hi Mary. Look in the salad dressing aisle for the bacon pieces (near the bacon bits, but you don’t want the fake stuff). Hormel and Oscar Meyer sell bags of real bacon pieces that are pre-cooked If you still can’t find them, then cooked and crumbled regular bacon would work fine The bag contains 2.8 oz, so you would need about 3 slices of cooked bacon to equal that Hope that helps! That helps a lot! I was thinking of the items in the meat case, not the dressing aisle I’m sure that product is available there! (Duh!) Gonna try this for Super Bowl Sunday….Thanks! This would be good in the Frito-Lay tortilla chips shaped like a bowl Prep would remain the same but the oven time would be shortened. That does sound like a good alternative, Kathy I will say, though, that the flaky, layered pastry cups is my favorite part so you might be missing out! Just found your recipe and am planning on making it for Superbowl Sunday! Cheering on the Ravens although I am a Redskin fan from NC. Quick question…did you use “bag” pre-shredded swiss cheese? Haven’t been to the store but curious where to look first. Thanks! Hey Michelle! These would be great for a Superbowl party! I did use the bag of shredded swiss cheese So much quicker than having to grate your own! Where do you find the pastry cups at? I looked at Walmart in freezer section and couldnt find them. They are in the freezer section, but I couldn’t find them at first either In my store, it wasn’t near the ice dream/desserts area like I thought, but near the frozen pizzas. I don’t know about your store, but it’s definitely frozen! I made these last night and they were a hit! Yum-O! What size can of rotel tomatoes? Hmmm I really don’t think crescent rolls would be a perfect substitute You could try tearing the crescent dough and putting it in a mini-muffin tin to form a little cup around the filling I’m not sure how it would turn out though I’m so sorry you can’t find the pastry cups! Let us know what you try and if it works out! I tried these with tortilla scoops, they’re like BLT’s with a kick!! They’re out in the warmer ready for the game!! Thanks, I will be making these again!! We were really looking forward to having these for the Superbowl because you just can’t go wrong when there’s Rotel involved, but unfortunately there wasn’t a single person that liked them There wasn’t a single person that ate more than one They looked like they would be delicious though! I’m sorry to hear that Emily! I really liked these! I used half Swiss & half Colby Jack Will definitely make again Hubby liked them too! Thanks Lavonn! I’m glad you liked them The combo of swiss and colby jack sounds great! These sound yummy except for the mayo. I hate mayo. Do you have any suggestion for a substitution for it? Hmm…I really don’t know! Maybe sour cream? Let me know what you try and how it turns out! Just found this recipe and it sounds great Would like to know if they’re good if they’re at room temp and not warm Will be driving 30 mins. to a bunco game and would love to take them but only if at room temp they will be good Thanks in advance for info. Hi Charlotte! Yes, these are good at room temp, although maybe not AS good as straight out of the oven, they will still be devoured! yet so good I will definitely be making them again Again, thank you. Oh yay! So happy to hear that! Thanks for letting us know they were a hit! I’m overseas and my grocery store is the super limited Needless to say, we don’t have the phyllo cups, but we do have phyllo pastry Do you think I could just make my own cups? Not as pretty of course, but same affect? hmmm…that’s a good question Mechele You probably can make your own cups using the pastry, but I honestly don’t know how you would go about it! I’m sorry that I can’t give you any more information than that If you try it, please let us know what you did and if it worked! Awesome! Thanks for letting us know what you did! I’m so glad they turned out ok! My mom makes these but she takes fajita size flour tortillas…cuts them into 1/4…puts thwm un a mini.muffin pan….tastes great!! What is a bag of bacon? Where do you buy it? They are in the salad dressing aisle at the grocery store They are basically bacon bits, but with real bacon and not the fake stuff. I always buy Hormel brand. Waaaar Eagle, Lindsay! Definitely gonna try these Rotel cups For Cindy who hates mayo: I make something similar that calls for cream cheese, drained whole kernel corn, & cheese baked in scoop-shaped corn chips Next time gonna put Rotel in mixture. War Eagle Sue!! Thanks for the great suggestion! I tried these but they had too much mayo in them for me Otherwise, not too bad. Thanks for the feedback, Mel! Glad they were a hit! Thanks for commenting! It does stink royally when your team looses. Have you tried using rotel tomatoes, sausage, velveeta cheese and bacon.I just wonder how the velveeta cheese would hold up. I have not tried Velveeta in these, although I do love the idea! It might sort of saturate the layers of pastry cups, meaning it wouldn’t be as crispy, but I be it’d still be delicious! Going to try this at our Mizzou Tailgate! We play Tennessee today! Loving the SEC and all the great fans we’ve met! This recipe looks like it will be a hit too! Thanks! I just made this last night and it is delicious. I tried to stop eating them after three, but couldn’t. Yummy. Glad you liked them Dorothy! They are super addictive! Came across your recipe and made it last night for the SEC Championship game (WAR EAGLE). These are absolutely to die for! Will be making them again when we play FSU in the Championship Game!! Just wondering if you have any suggestions, as far as something else in place of the bacon pieces, as we have vegetarians in the family that won’t go for the bacon! I was thinking maybe chopped green peppers, but would welcome any other suggestions. Otherwise, I will just put the bacon in part of them & leave them out of the rest. Going to make them for Christmas eve appetizers, so maybe both red & green bell peppers to keep them festive! Hi Valerie! To be honest, this is totally out of my area of expertise because I’m a meat lover through and through. However, I really like your idea about the bell peppers, especially with them being Christmas colored! One thing the bacon really added was a saltiness so I’d also recommend putting a tad bit of salt in your mixture. Let me know how it works out! What is the nutritional content i.e. calories, fat, carbs, for how many? Can’t wait to try this, but never heard of “bag of bacon pieces”. Is this product already cooked? Yes they are already cooked. They’re located with the other salad toppings like croutons. There are fake bacon bits which taste terrible and then there are these bags of real bacon pieces that are SO much better. I always buy the Hormel brand. I plan on making these tomorrow night for a house warming party. 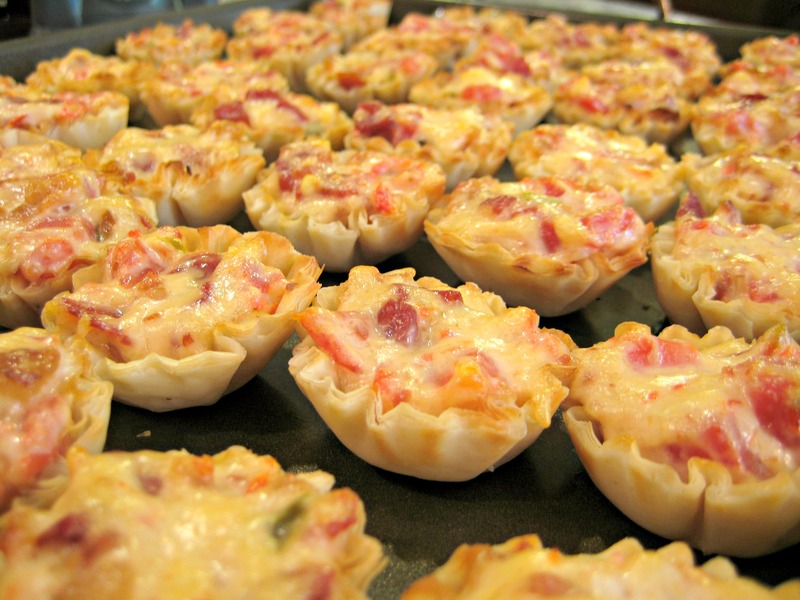 My husband (who is always wanting to help) wondered if the filling makes the little pastry cups soggy and if you should cook the little cups first? I want them to be a big hit so I wanted to ask you. Thanks in advance!! No need to bake the cups first! They don’t get soggy and still have a good crunch! Have you tried cooking them ahead of time, refrigerate, and re-heat later? If so did they become soggy, less crunchy? Was thinking about preparing for my college kids to heat up for late night study? if prob not a good idea, let me know… and WAR EAGLE!!! War Eagle, Connie!! I haven’t ever tried making them ahead of time, but I do think they’d probably get soggy, at least in the bottom of the shells. If you wanted, you could mix up the filling beforehand and refrigerate it. Then just fill and bake when you’re ready to eat them. Let me know what you try and how it turns out! makes sense, great suggestion!! Thanks and enjoy the game today!! Haha awesome! You’re very welcome! how many does a recipe make? Would like to take to potluck luncheon. wondering if Greek yogurt could be used instead of mayo? I’ve never tried it, but I don’t see why not! I know several others have commented abut using it as a substitute. Let us know how it turns out! The first time I took these to a gathering everyone loved them, so now when invited to any social, I am asked to bring them, they are really yummy!!! Thanks Dottie! It’s nice to have a “go-to” dish for taking to socials that you know everyone will love! can’t wait to try these! Do you think using sausage instead of bacon would work? I think sausage would taste great! You probably wouldn’t need very much. The shells are not pre cooked. They are frozen and then will need to be baked (with the delicious mixture scooped inside) after they thaw. Hi Thomas. The mayo is kinda the glue that holds everything together in this recipe. If you choose to omit the mayo, I’d recommend something else like maybe greek yogurt or sour cream. I’m sure it will have a different taste, but if you don’t like mayo, give it a shot! Please let us know how it turns out if you give it a try. Was just wondering what type ( brand ) of mayo to use ( is it real mayo or what ) ? I think it’s just personal preference. I use Kraft mayo made with olive oil. It’s a little bit healthier than regular mayo, but tastes way better than most other light versions. It doesn’t have to be that kind though, just use whichever mayo you like! Thanks Kara! Glad they were a hit. I bet they were good with shrimp in them! You don’t want people pinning your recipes on Pinterest? I pinned this and they deleted it saying it was a copyright infringement. I am confused. I pretty much use Pinterest as my source for recipes when cooking anything now, rather printing paper copies. I will get the recipes elsewhere if that is the case. Hi Katherine. I absolutely want you to pin my recipes to Pinterest! Please pin away! I even put user-friendly share buttons on my recipes so they can be shared on various social media outlets! The issue is not you pinning recipes. Sadly, other people steal my content (the photos and recipes) and then publish them on other websites. This is copyright infringement and is against the law. This particularly recipes has been stolen dozens of times over since it’s one of my more popular ones. So Pinterest deletes these pins that link back to the offender’s websites. Obviously the people who pin them don’t know whether the content is original or stolen, so it’s not their fault at all. That said, if you pin something that links back to here at Normal Cooking, Pinterest should not have deleted it! So thank you for letting me know so I can make sure they are not deleting the wrong pins! Again, please pin and share any recipe you find here on my site!